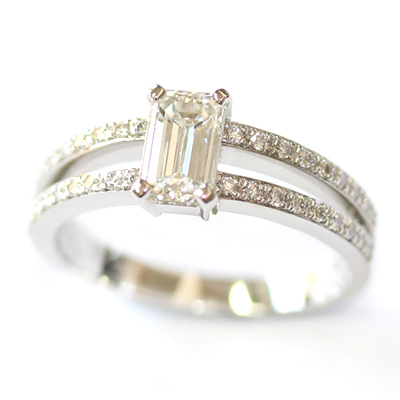 A stunning emerald cut diamond engagement ring with split diamond set shoulders. 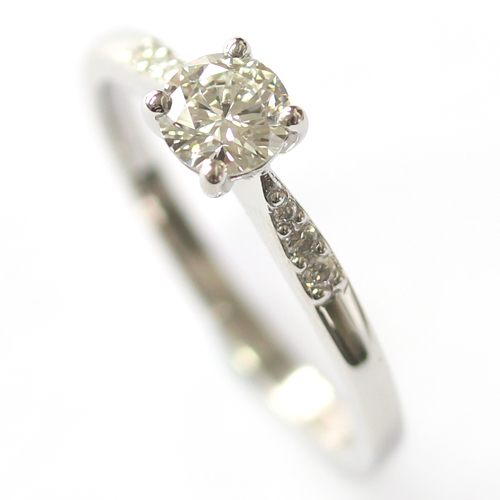 This bespoke engagement ring showcases a sparkling twist on the classic solitaire style. 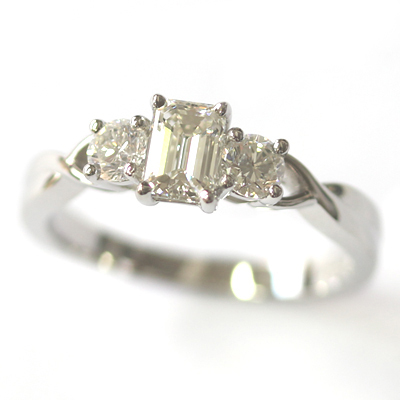 At the heart of the design is a bold and beautiful emerald cut diamond, handset in a neat four-claw setting. 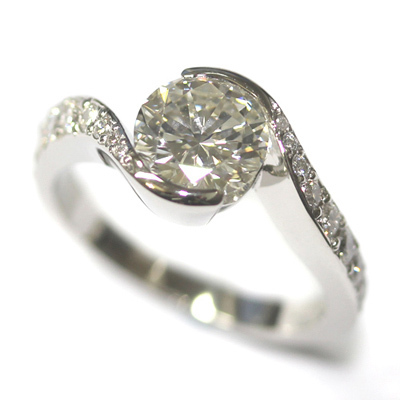 Then, for the twist, the shoulders of the ring are split and fully set with round brilliant cut diamonds. A real sparkler! 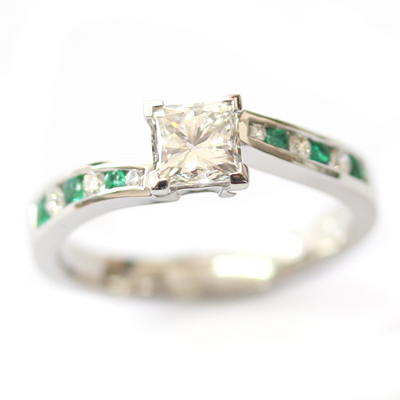 A bespoke platinum engagement ring with emeralds, sapphires and diamonds. 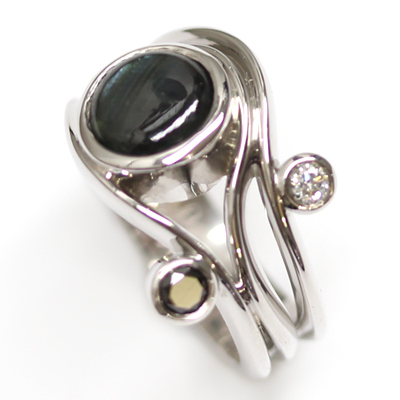 Following the proposal, the couple designed this engagement ring together. When they came to visit our Yorkshire studio, the bride-to-be had hand-drawn her ideas and, alongside the guidance of our expert jewellers, the design was finalised and then translated onto CAD. 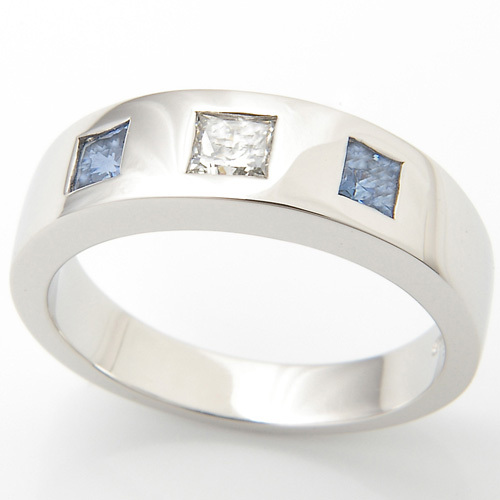 The CAD files were then sent to the casters so that the ring could be created in platinum. 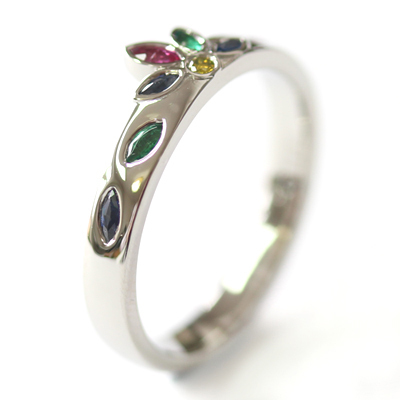 The ring centres around a collection of coloured precious stones in a flower and leaf design. Our team sourced a selection of green, blue, pink and yellow stones for the customer to view and then the customer chose their perfect stones. The ring boasts emeralds, pink and blue sapphires and yellow diamonds. All the stones are marquise cut and have been rub set by hand for a tactile finish. 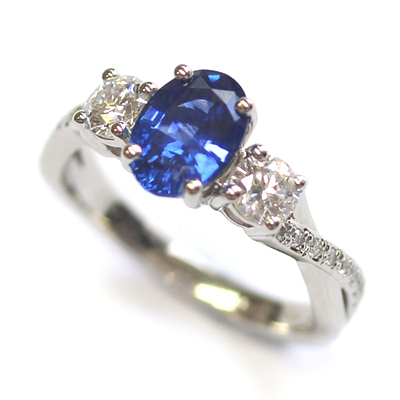 A truly bespoke, bright and beautiful engagement ring designed by the customer and handmade by our recommended Yorkshire jewellers. 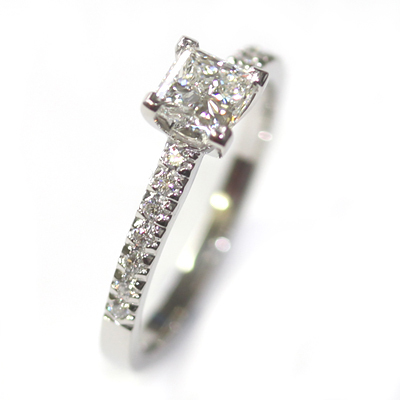 A beautiful engagement ring with a princess cut diamond and part diamond set shoulders. 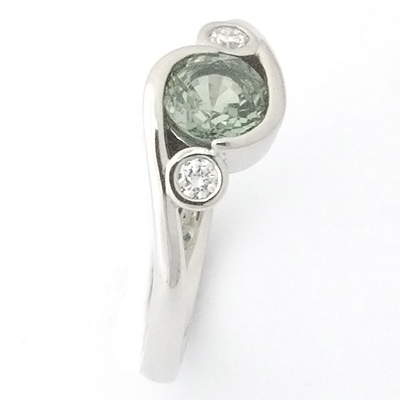 A bespoke engagement ring using green sapphire and diamonds. 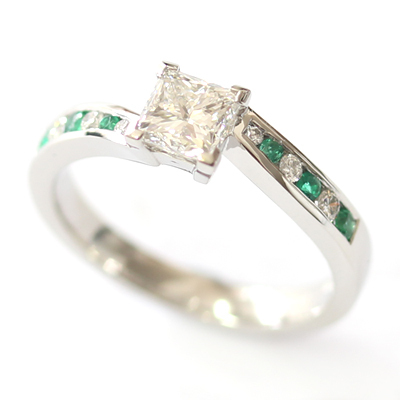 After their initial meeting with one of our expert jewellers here at Form Bespoke Jewellers, the customer decided on the main details of their bespoke green sapphire and diamond engagement ring. 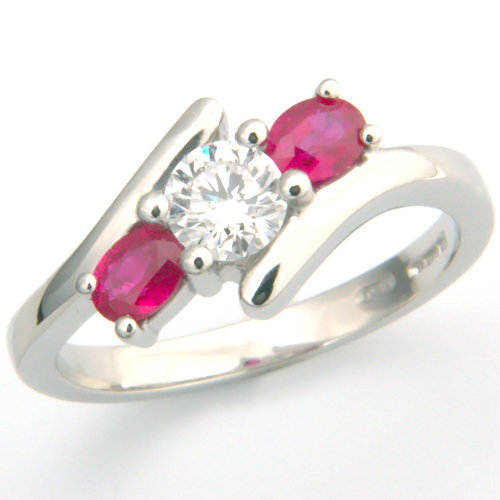 Using Computer Aided Design (CAD), our jeweller then created a 3D rendered image of the customer’s design which, once approved, was sent to the casters. Here it was cast into the customer’s chosen metal, platinum. 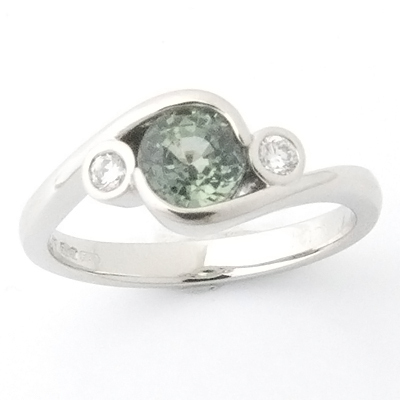 On it’s return to us, the engagement ring was set with the round brilliant cut green sapphire centre stone. 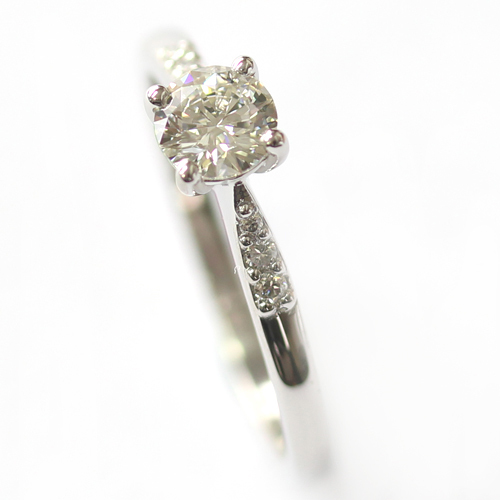 Then two round brilliant cut diamonds were rub set either side. 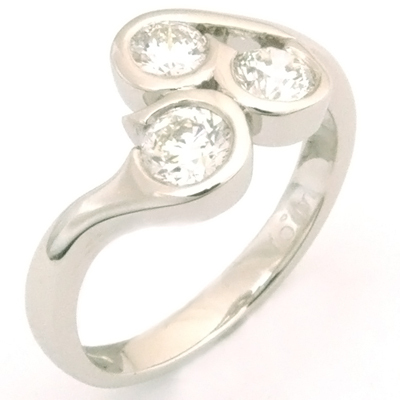 The customer was thrilled with their final piece of fine jewellery, especially being able to see his design come to life. 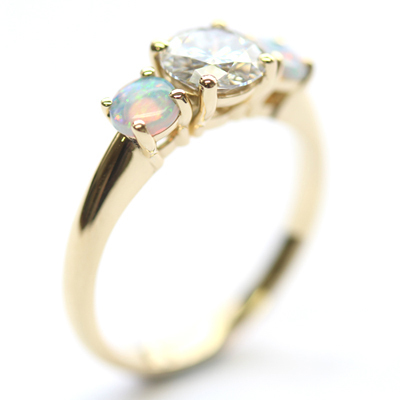 A stunning bespoke diamond and pearl trilogy engagement ring. 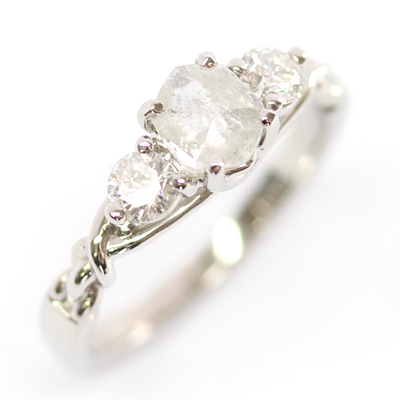 This handmade engagement ring showcases a classic trilogy style with a larger centre stone flanked by two smaller stones. 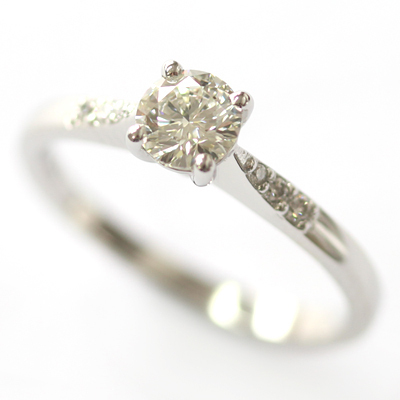 At its centre is a round brilliant cut diamond which has been rub set for a tactile finish. Either side of the diamond are two matching pearls, also rub set but sitting higher rather than flush to the metal. 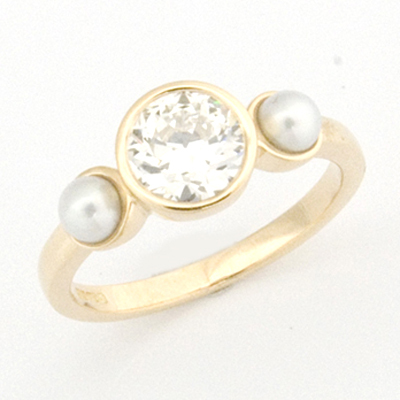 The customer chose to have the engagement ring cast in 18ct yellow gold which really helps to show off the milky white of the pearls and the sparkle of the diamond. 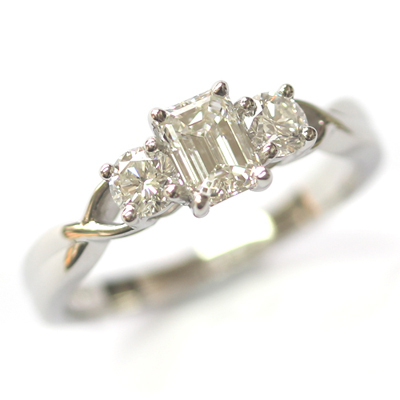 We love this trilogy engagement ring as it has beautiful proportion and a lovely warm tone. 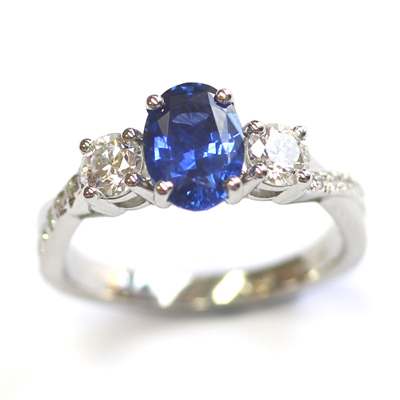 A modern trilogy engagement ring using princess cut sapphires and diamond. 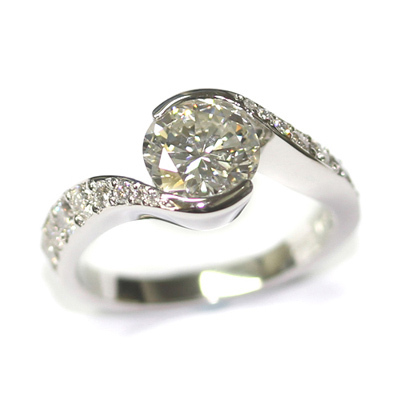 The customer had seen a ring on our website that we had created for another customer which had three round brilliant cut diamonds set into it. 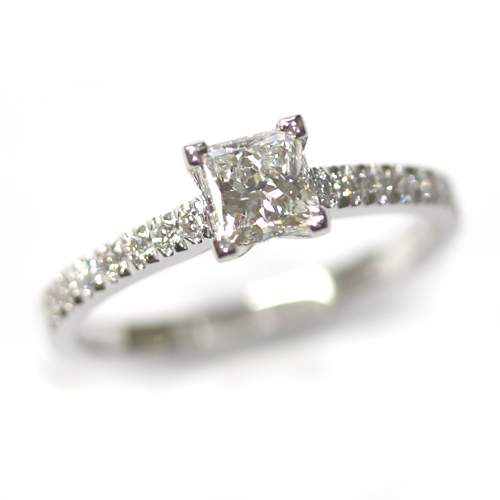 The team at Form Bespoke Jewellers in Leeds then created a completely fresh look by recreating this design in a platinum band using princess cut stones. 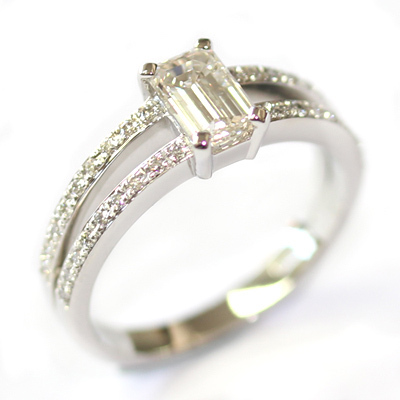 The customer chose two 0.22ct princess cut sapphires and a 0.18 carat, G colour, VS clarity princess cut diamond centre stone. 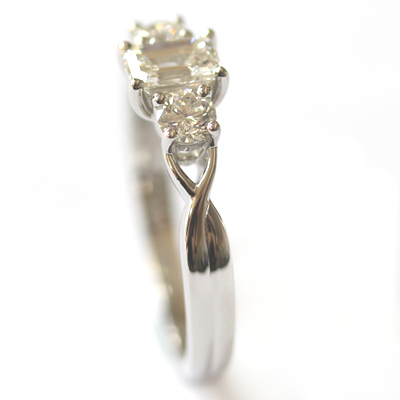 A bespoke trilogy engagement ring showcasing an uncut diamond. 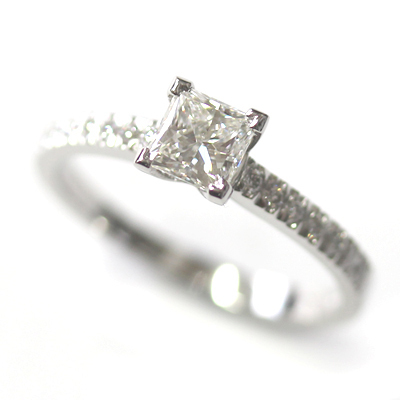 The customer came to us knowing that they want to use an uncut diamond as the centre stone in a unique trilogy engagement ring. It was all about combining rustic and modern design. 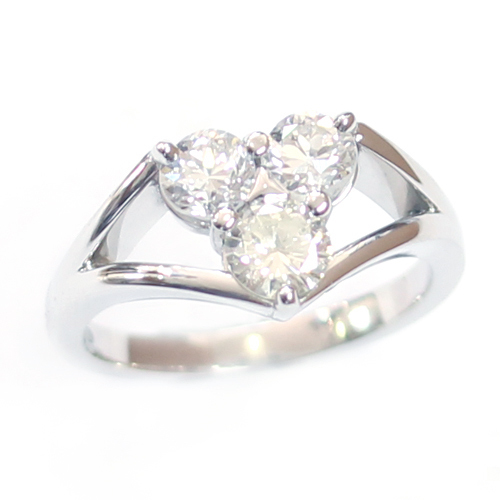 So the first port of call was to find the perfect diamond combination. Our expert jewellers sourced a selection of uncut and polished diamonds for the customer to view. 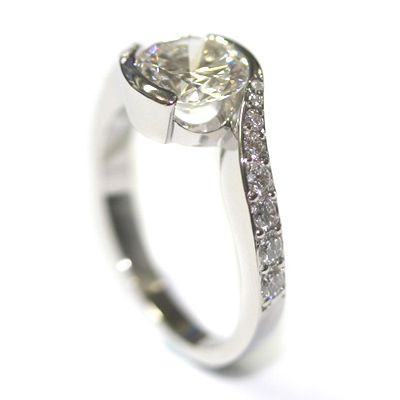 They chose the specific uncut diamond for the centre and then decided on two round brilliant cut diamonds to flank it. The round diamonds are of matching colour and clarity to frame the uncut diamond beautifully and create a sparkling balance in the trilogy. 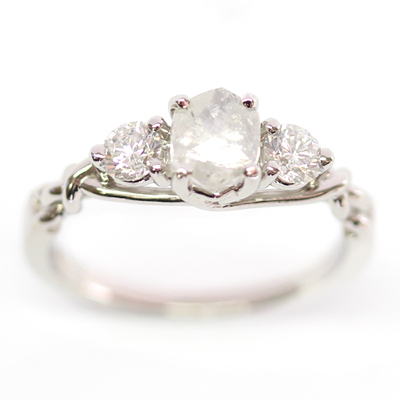 It was important to the customer that the engagement ring also had a unique setting and shoulder detail. Working from some designs that they had seen online (and that they knew their partner liked! ), a plaited design developed. The shoulders would transform into a plait that then wrapped around the neat trilogy setting. It was all about the charming, contrasting detail with this design. The customer managed to incorporate all the personal touches that were important to them and the final design was beautiful. 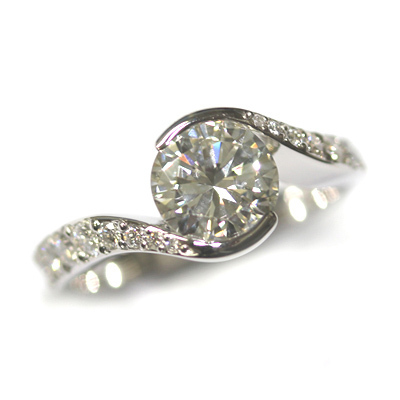 This diamond engagement ring takes inspiration from the Hindu syllable OM. 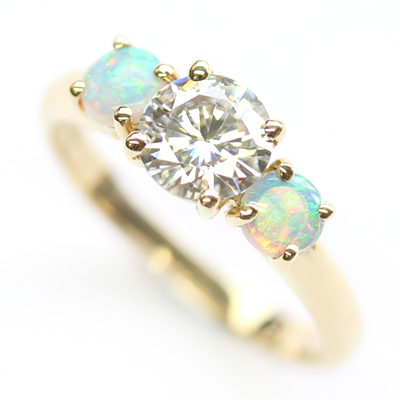 At Form Bespoke Jewellers, we love working with our customers to create new designs which are influenced by personal experience or symbols which are personal to the individual. This customer had already worked out some rough sketches of an engagement ring in which he wanted to reflect the symbolism of the Hindu syllable OM (a cosmic energy in everything that exists). 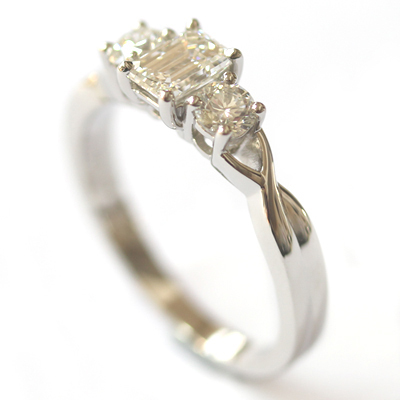 The team at Form Bespoke Jewellers worked with him to create this stunning design which was then cast in platinum. Featuring two 0.25ct and one 0.16carat round brilliant cut diamonds of E colour and VS1 clarity, this engagement ring not only looks beautiful but also carries meaning and personal sentiment. 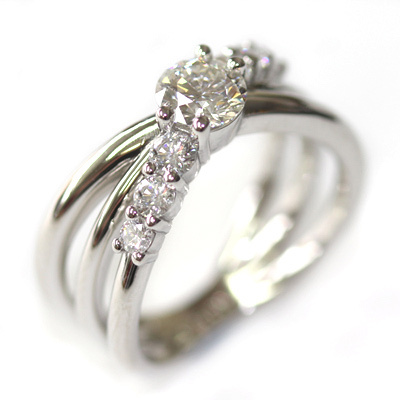 The customer also returned to us for a bespoke fitted wedding ring that would sit perfectly alongside their unique engagement ring.